In order to plant, tend, and cultivate your roses, you need the right tools. There are a number of useful all purpose garden tools and some of them are perfect for rose gardening. Here are the basic tools that can help you ensure that you are caring properly for your rose garden. These are essential if you plan to work in your rose garden with any sort of enjoyment at all. Nobody enjoys being scratched by thorns. They can be sharp and painful, and scratches can lead to infection. Thorns are a necessary evil associated with working with roses. However, a good, sturdy pair of work gloves can protect your hands while you work. You might find them clumsy to work with at first, but working with roses does not require great dexterity. The heavy leather kind with big cuffs provide excellent protection while working with your roses as well as anywhere else in the garden. 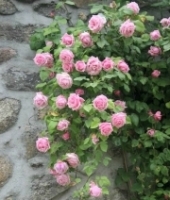 Unless you enjoy backaches brought on by stooping over, you will find yourself kneeling for some of the chores you need to do around your roses. A kneeling pad or pads will make this more comfortable for you and easier on your skin or clothes. There are inexpensive knee cups that can be strapped around the leg and move easily when you do, but can be uncomfortable if they don't fit properly. The best way is to have a plastic or otherwise water resistant pad that has handles. You could use an old chair cushion. Alternatively, if you would rather sit that kneel, there are small stools available that are low to the ground and have large wheels and a handy storage space under the seat. Pruning shears also known as pruners, make it a snap to keep your roses in good shape, pruning back excess growth and getting rid of dead, damaged or diseased portions. It is important, that you get the right kind of pruners for roses. You do not want anvil pruners whose blades fall one on top of the other. They are likely to crush your rose stems and canes. This can cause a great deal of damage and invite diseases and pests to take advantage. Always use bypass pruners on your roses. These work like scissors, where the blades pass each other. As your roses mature, you will also need a lopper. This is the heavy-duty relative of the bypass pruner, equipped with long handles. Loppers are used much like shears to remove thick, old or dead canes that pruners can�t handle. The shovel is of course for digging holes for planting and digging up roses and other bushes for transplanting. Choose one that has a point and is both sturdy and lightweight. A fiberglass shovel with a long handle is excellent for this kind of work, as it does not weigh very much and won't rust. A small hand shovel will come in handy at times and is useful all around the garden. A digging fork is an excellent tool for loosening soil and turning it in patches too small to be worked on with a shovel. There are two types of rakes that you should have to enhance your rose gardening. A regular garden rake is the one that has steel teeth. This type of rake is used to smooth and level soil. Choose a sturdy rake with steel tines (no plastic tines here). The other type of rake is a leaf rake. These are the fan-shaped rakes that make cleaning leaves, clippings, and other garden debris much easier. You should have two leaf rakes, a regular rake and a child's rake for smaller and tighter areas. None of the above items are of a special nature and you should have no trouble finding them at most garden centers and home improvement stores. Also watch for neighborhood garage sales, you can sometimes find good used items there at very low prices.